Spring Cleaning? Extreme Home Makeover? Whose been sleeping in your bed? You don't want to know. But, if you really want to give every inch of your home a meticulous spring cleaning, read on. Ari White, a.k.a. "The Mattress Doctor", called New York Tails and asked if he could give us a free demonstration of his unique mattress-cleaning service. 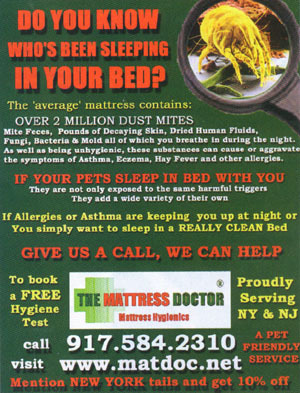 According to Mr. White, an average bed contains two million dust mites, nasty little microscopic creatures that feast upon skin flakes shed by human and beast alike. Unfortunately, many people who have "dust allergies" are actually allergic to these critters, or, to say it delicately, their microscopic "poop." We knew just where to send Mr. White-the bed of our web designer, Marsha Henkin, who has battled severe allergies and asthma for most of her life and sleeps with husband Jerry and three pampered cats: Oscar, Zowie, and 16-year old Frankie, whose respiratory difficulties grow worse with age. Armed with a special 700-watt vacuum cleaner with UVC lights emanating a faint blue glow from under its wide nozzle, Mr. White donned a pair of gloves and goggles and set to work. Within 90 seconds of vacuuming the apparently clean bed--nary a stray cat hair was detected on the surface--Mr. White's vacuum produced a pouch full of cat hair and other colored "stuff" that Mr. White identified as dust-mite doo. Any noticeable after-effects? "I noticed that Frankie is actually breathing a little easier," Ms. Henkin reported about a week after Mr. White's visit. "And I think I am, too." Another pet reportedly breathing easier is Shadow, a 17 year-old cocker spaniel belonging to Ann Higgins, a local distributor and devoted client of EcoQuest's "Living Air" purifiers. "My dog used to snore his head off," Ms. Higgins said. "Now, with the EcoQuest unit, he doesn't." The units reportedly banish kitty litter and other odors our otherwise lovable pets emit, too. One speaker-sized unit can apparently oxidize odors from a 3000 square-foot space. It's springtime in New York, and many an urbanite's thoughts are turning to thoughts of a major spring cleaning, home improvement project, or both. If you share your life with pets, you need to take a few extra steps to keep them out of harm's way before you roll up your sleeves and dig into an extreme spring makeover. "We do get an increase in the number of medical emergency calls we receive when the weather becomes temperate," said Dana Farbman, a certified veterinary technician and senior manager of client and professional relations at the ASPCA. Some calls fall into the "miscellaneous hazard" category, meaning a pet has gotten their nose, paws, beak or claws into an unattended cleaning substance. The good news, according to Ms. Farbman, is that most common household cleaners are safe to use around pets as long as you read the label and follow the directions. This includes products like Febreeze and Swiffer Wet Jet, which sometimes pop up in email alerts as potential pet killers. Are they, in fact, dangerous? "Absolutely not," Ms. Farbman says. "This is just an Internet rumor. Scientifically and toxicologically, it doesn't make sense. Certainly if an animal licked the cleaner from the Wet Jet off the floor we might see stomach upset, but not liver or kidney failure, as the rumor says." You would see kidney and liver failure, Ms. Farbman says, from antifreeze ingestion, but the Wet Jet doesn't contain antifreeze. Febreeze is also safe, although Ms. Farbman, who has two parakeets and an affinity for air fresheners, cautions bird owners to use care when using aerosols or anything with strong fumes. "Birds have very sensitive respiratory systems," she says, "so remove them from the room and allow it to air out before returning them to it, just to be safe." Watch what you throw out from the medicine cabinet while you're cleaning. Many emergency calls to the ASPCA involve pets who chomped on an old or expired bottle or blister pack of winter cold medicine. "Pseudoephedrine (a nasal decongestant found in over-the-counter drugs like Sudafed) has a very narrow margin of safety in dogs, cats and other animals," warns Dr. Steve Hansen, veterinary toxicologist and senior vice-president of the ASPCA's Animal Poison Control Center. As little as one tablet containing 20 milligrams of pseudoephedrine could cause serious harm to a 20-pound dog. Three tablets can kill him. "A common thing we see is a cat knocking a bottle of pills down from the counter and the dog gulping them up," Ms. Farbman says. But pets often get pseudoephedrine into their systems by a more direct route-administration by their owners. Like humans, pets can get seasonal and other types of allergies. Often a vet will tell the owner to give their pet diphenhydramine (the active ingredient in Benadryl and other over-the-counter allergy drugs.) Problem is, many of these kinds of drugs are combos of diphenhydramine and pseudoephedrine. "The key thing is to read the label and make sure you are giving your pet only what your vet recommended," Ms. Farbman said. Finally decided to clean behind that scary dark space behind the refrigerator, under the carpet, or under the bathroom sink? Toxins kicked up by removing mold from these and other places during a thorough spring cleaning can pose a danger to pets. Certain species of mold can produce mycotoxins, which can produce gastrointestinal, cardiac and/or neurologic effects such as tremors and seizures in house pets. If mold is discovered in the home pet owners should contact the Environmental Protection Agency at www.epa.gov/mold for information on mold hazards, including safe cleaning and removal in order to avoid the potential for problems. So the house is scrubbed and sparkling, yet something is still missing. Perhaps a new plant would brighten up the place, or a fresh coat of paint, or maybe a new cabinet or shelves from one of those do-it-yourself kits. No harm in that, right? When purchasing a plant, make sure it is not a potential poison for your pet. Cats, especially, are notorious for chewing on plants. While this is the time of year that Easter and other decorative lilies may catch your eye, forget about them if you have a cat. Easter, Day, Tiger and any lilly of the genus lilium or hemerocallis can potentially kill your curious cat. Tulip bulbs are also a potential hazard. "The best way to make sure you're not bringing a dangerous plant into the house is by getting a solid identification through the scientific name or genus or species," Ms. Farbman says. Better to play it safe and still be seasonal with white or yellow roses, irises or African violets. Most water-based latex paints are relatively low in toxicity, but could still produce gastrointestinal upset. Artist's paints or other specialty paints could contain heavy metals that could potentially be harmful if large enough amounts are ingested. Should your pet get paint on its skin or coat, never use paint thinner or similar solvents to remove it--a chemical burn could result. Use a mild pet shampoo or liquid hand dishwashing detergent instead, or have a vet or groomer shave the spot off. Adhesives and glues need to be handled with care, too. Depending on the type of adhesive involved, a variety of clinical effects are possible following ingestion. Certain construction glues may produce only mild gastrointestinal upset, while others can cause more significant irritation. Additionally, some expanding glue products can result in a potentially life-threatening gastrointestinal obstruction if ingested. Planning to go all out and bust down some walls or rip out your sink? Older homes and apartment buildings, particularly those built prior to 1978, may contain surfaces that have been painted with lead-based paints. Lead exposures can occur from eating paint chips or by inhaling paint dust from sanded/scraped surfaces. Other potential sources of lead can include drapery weights, plumbing parts, putty, rug pads and linoleum. Lead exposures can produce gastrointestinal, behavioral or neurologic effects, as well as clinical symptoms from anemia. Call your landlord and find out how old your place is and whether lead-based paints or other building materials may be present in your home before you start any major renovation. Once renovations begin, pets could be tempted to chomp on nails, tacks, staples, screws, insulation, electrical cords on power tools, etc. Ingestion of nails and other small hardware fasteners can cause damage to the gastrointestinal tract and could result in an obstruction as well. Pets chewing on plugged in electrical cords could become electrocuted and/or suffer electrical burns to the mouth. If, in spite of all of your efforts, your pet still put its nose or mouth where it doesn't belong, keep the product container or label handy and call your personal vet or the ASPCA's Animal Poison Control Center (1-888-426-4435) for instructions on what to do. Keep in mind that the ASPCA hotline charges $50.00 for a phone-in consultation. Prevention is the key to avoiding problems from accidental exposures to chemicals and hazardous materials you may break out for your spring cleaning and home improvement projects. Keep pets out of areas where renovation or other home improvement projects are happening-consider boarding them elsewhere for a day or two if necessary. With a little planning on your part, you and your pets can enjoy the fruits of your springtime labors.